I made new togs. These were a bit overdue as pair I made in January disintegrated. Well the red did that stretch out thing and the aqua (which was at least 20 years old) was still fine, such was the quality of that remnant. I knew they wouldn't last long as the red was very thin and not good quality plus the heat and chlorine from the night aqua classes really eats into the fabric. So onto the new pair. 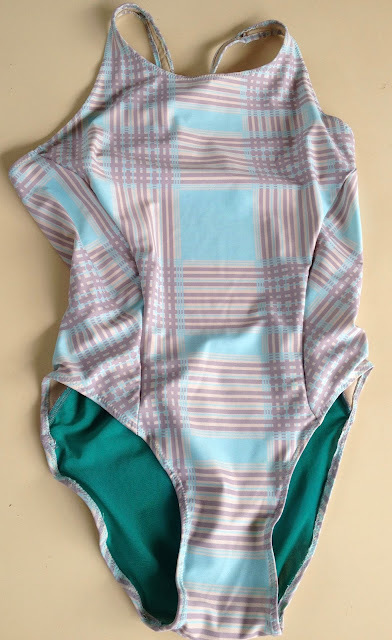 It is still using the same pattern cut out from a pair of Arena togs that fit well that the last pair was to test if my tracing off was ok. These are made from a remnant piece of lycra from The Fabric Store a few years ago. Really I don't know why I bought it, it's not really my colours but it has a beautiful feel. It was about a metre long and $17 so that's probably why.. it is really lovely quality. 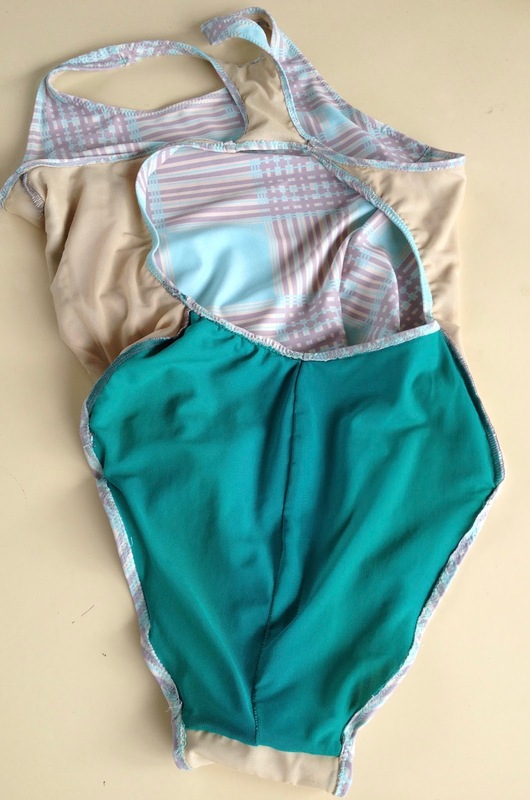 I don't know how long they'll last; when you swim in chlorine a few times a week togs don't last long. The original togs had the bottom piece cut on the fold, but I put a seam in to round out the bottom for a better fit for my round bottom. I fully lined the togs and I used some green power net I cut out from the lining of togs I bought a while ago. I always have to thing about how to do the lining so the seams at the crotch are fully enclosed. I kind of walk my way through it to make sure... I don't want to unpick lycra. I used some clear swimwear elastic because I couldn't (and still can't) find the new rubber elastic I bought a few weeks ago. I used my teflon foot and a microtex needle which was really good (and expensive). Until I had most of the elastic put on .. then my machine kept jumping stitches. I thought it was the machine and pulled out the Brother I found on the street but same thing. I changed needles, broke one (damn because they are expensive) and changed thread... nope same thing. Left it for a day (I know when the universe tells me to step away from the machine) and tried again the next day. Same frustration. 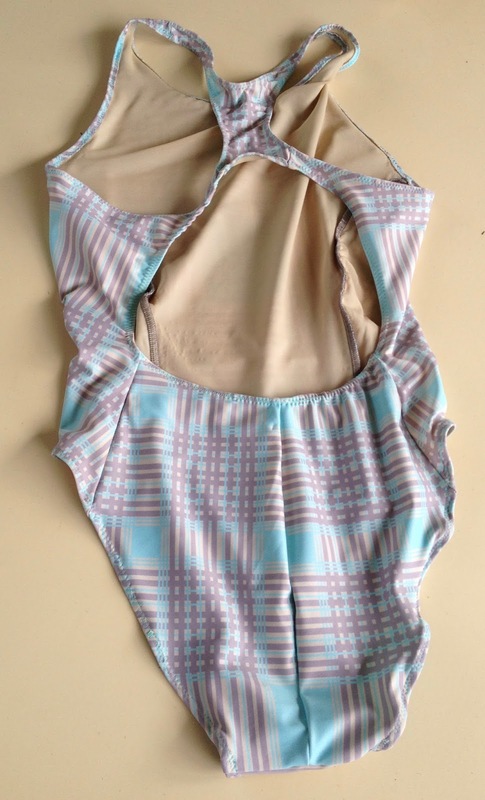 The only thing left was to turn the togs over and sew on the other side and no problem. Why this happened I have no idea. One minute it's going great and literally the next second it's not working and simply turning the fabric over makes it work fine?? When you sew long enough you realise it's better to not waste time trying to work it out, just go with it. The is the dress I've been working on using a polka dot fabric from East Coast Fabrics I bought when I was up at Maroochydore at New Year. I was procrastinating doing the facings for a week and then I had the Destash to Restash market and it's still waiting. Hopefully this weekend. Thanks. Really try because it is so easy. Any wobbly elastic stretches out and is not noticed when they are on. Probably one of the easiest things to make really. I'm trying to psych myself up to making a leotard. I bought a pattern exactly in the style I want in the recent Spotties sales and I haz fabric from when I was in the Gold Coast, from East coast fabrics. I am so .... unsure! I'll have to just DO IT. You know, nike style. With lots and lots and lots of tea. And maybe a smoothie afterwards as a reward. It's very pretty fabric and I really like the pattern. I would think it looks good on. Oh yes just do it. It's only fabric. I'll be looking out for it. I got frustrated with making swimmers - couldn't concentrate on them earlier in the year, now it's getting away from swimming weather (my late aqua class finished last week but I might try to get to some of the earlier/indoor ones). 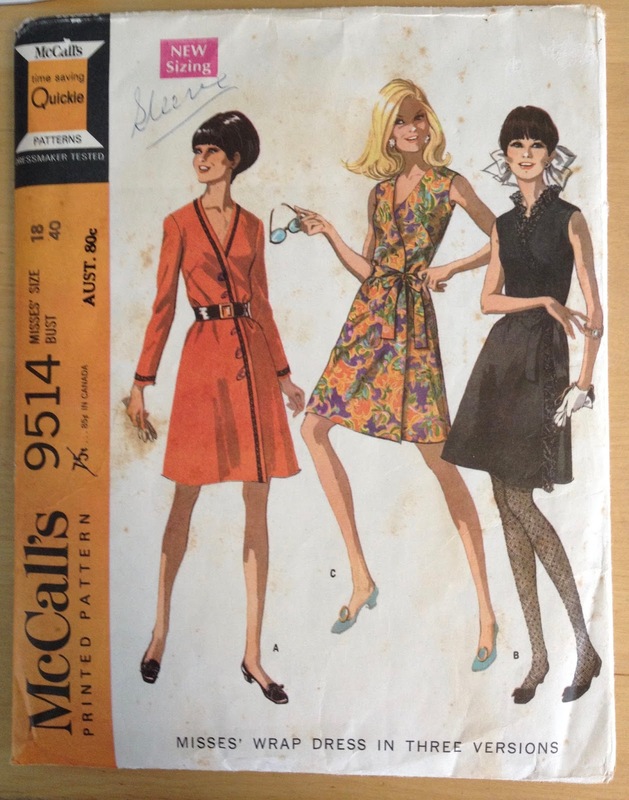 McCall's pattern looks fun! Yeah I think when you start and you have to get the 'feel' for putting the elastic on it is frustrating. Then you get the 'feel' and it goes ok. I think I'm going to head my disintegrating togs off at the pass and start another one while I have the 'feel'.